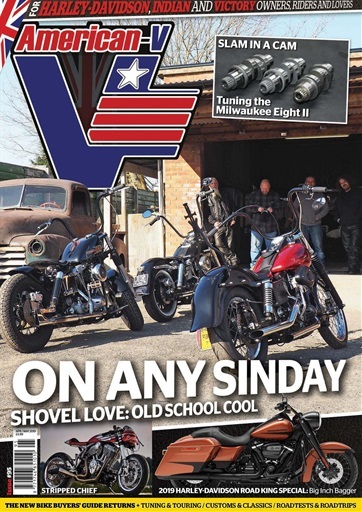 (2 Customer Reviews) | Write Review 6 issues per year American-V is the UK's only consumer title that deals with America's iconic motorcycles and their impact on the lives of a rich diversity of owners from all backgrounds. The bi-monthly magazine appeals whether it is covering the extravagant customs of lifestyle bikers, the technical heritage beloved of classic enthusiasts, the long-haul comfort of intercontinental riders or a growing number of lifetime motorcyclists discovering the sense of freedom associated with the marque for the first time. It is an informed, in-depth, broad appeal magazine that assumes an intelligent, literate readership and represents excellent value to its committed followers. A day well spent riding motorcycles when there are 'more important' things that you should be doing. Forget the spring cleaning, put that paint scraper down and defer servicing the lawnmower: the sun's out so stick an extra pair of thermals under your kevlar jears, and make sure the thermal liner is in your jacket and get out there. This issue we've done just that, making the most of some late February winter sun; and we've had a good play on the new 114-inch version of the Road King Special, revisited the 107-inch Ultra – now superseded – that we rode back from Prague, gasped at the power and torque that Boz is pulling out of a Milwaukee Eight Sport Glide and taken a look at what Vincent Pels has done to make his new Fat Bob better suit his traditional aesthetics, and we've taken a magical history tour down the Middle Rhine with the locals. American-V is the UK's only consumer title that deals with America's iconic motorcycles and their impact on the lives of a rich diversity of owners from all backgrounds. The bi-monthly magazine appeals whether it is covering the extravagant customs of lifestyle bikers, the technical heritage beloved of classic enthusiasts, the long-haul comfort of intercontinental riders or a growing number of lifetime motorcyclists discovering the sense of freedom associated with the marque for the first time. It is an informed, in-depth, broad appeal magazine that assumes an intelligent, literate readership and represents excellent value to its committed followers. You'll receive 6 issues during a 1 year American-V magazine subscription. I have been reading this magazine for many years and it just gets better and better. There is just the right amount of content on each subject without being boring or assuming. It is a read that gets read over and over again. Sometime in the future it will be selected out of my magazine collection for reference and to remind myself of the excellent information it beholds. I challenge anyone to find a better magazine than this. You'll receive 6 issues during a 1 year American-V magazine print subscription.